Coach hire, Herts, Essex and London. 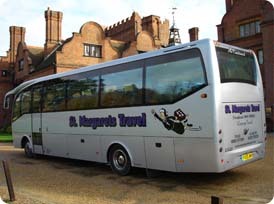 St Margarets coach hire. 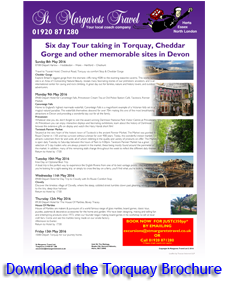 Looking for a local coach company for coach hire for your group? Call us now on 01920 871 280 and we’ll help you with your selection from our range of luxury coaches for your coach trip, within your budget. When considering coach hire companies you’ll find, like our regular clients below, that St. Margarets Travel provide coach travel with the highest level of comfort, safety and reliability expected of a prestige operator, all at very fair rates. There are no middle-men when dealing with St. Margarets coach hire - you're dealing directly with the people who care about your journey, every time. 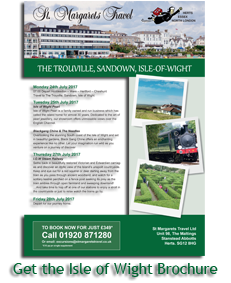 St. Margarets Travel is the trusted provider looking after the group travel needs of some of the county’s biggest employers, the group travel of children at our schools and the general needs of countless groups, clubs and societies. “Cheap coach hire” is not the objective of St. Margarets Travel as the business has been built by the founders on quality and value; standards still maintained today by St. Margarets Travel and enjoyed by an ever widening private and business customer base. "What a wonderful day we had. Perfect. And this was due mainly to the wonderful drivers we had. They were both absolutely superb and went beyond the realms of duty"
Your group travel is in safe hands - call us today or complete the easy to use Get A Quote at the top right of this page.